By hunting areas with minimal access and limited ATV use, our bulls grow old. This bull has actually been in decline for at least one season. This hunt is undoubtedly one of the most difficult things you will ever do. This is true backcountry wilderness hunting. You will explore through mountain valleys, dark forest and seemingly endless bog in search of mature bulls. Boots and backpack will be the main means of transportation around this hunting paradise, sleeping on the ground where ever the day ends. Our zone offers some of the tightest restrictions on ATV and 4x4 use in Alberta, and as a result, few are willing to endure after these tucked away mountain moose. Our archery hunts take place during the final week of the archery season, September 17 to 23, when bulls have completed rubbing the velvet from their antlers and are aggressively establishing territory. Bull moose will be callable in this week, responding bluntly to the sounds of a new bull entering his domain. An arrow rarely needs to fly more then 20 yards before hitting target (typically a bull moose in the 45 inch range), but longer shots can be encountered in some more open terrain. As the sun sets, long shadows provide a reprieve from day time heat. This encourages bulls into mountain meadows from their daytime hide outs tucked deep into thick forests. Our base camp is situated along a beautiful river and offers some excellent fishing opportunities during the mid day heat. 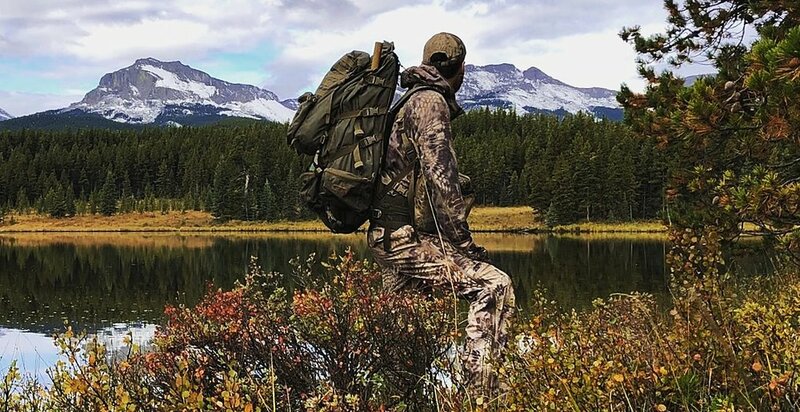 Mountain water and home cooked meals featuring Alberta beef, venison, and fresh vegetables will recharge you after a few days away from camp. Our base camp has comfortable wall tents, wood stoves, lanterns, grill, BBQ, and a shower unit. While a power pack is in the base camp, it should be expected to only have it for recharging personal electronics. The perimeter of our base camp is also protected by an electric fence. Logging and oil/gas create some spectaular habitat that can be exploited if the weather is uncooperative, or for hunters with limited mobility. A few mature trees offer anchor points to pitch a back country tarp shelter and drying line. Open air and starry skies are to be expected. Spike camp is one of the critical components of makes the western hunting experience, that of a lifetime. Spike camp will be where ever we end up at dark. Top end back country shelters from Kifaru International are provided to clients, as are lightweight back packing stoves and meals. Depending on the location, a fire may or may not be appropriate. Meals will consist of dehydrated goods (meats, pastas, rice, fruits) and other backpack friendly options (granola bars). We are veteran owned and operated. All of our staff have served in conflict areas around the globe, including Somalia, Bosnia, and Afghanistan. Our guides unique experience and skill set lends itself to thriving in remote back country areas, where ingenuity and execution result in success. We will do everything within our power to ensure your success on our adventures. All of your food and snacks, once we pick you up.